Beneath the Rowan Tree: Spotlight: Our Little Tee in a Storque Spotlight! How exciting! OK, kind of cool anyway! 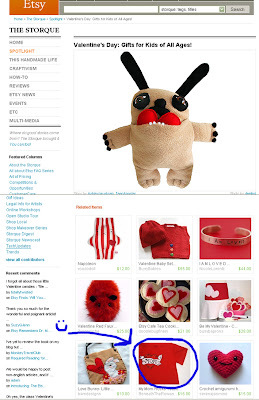 Our little heart tattoo tshirt was used in a Spotlight Treasury on Etsy's Storque newsletter today. Made me happy. No sale, but that one tshirt got over 700 views. Yowza. Pardon the poor screenshot, it was gone when I realized I missed the middle piece! Oops.